While of course the cottage is in need of the most work, the shop on the farm is also very special. I am told it used to be called the “Rest-a-While tea room, and people would drive out on a Sunday afternoon for scones and cream. The response to the call to help save Kok’s Cottage has been overwhelming. People are volunteering their time and their special skills. I just took a call now from an old friend who is able to re-do the damaged window and door frames to match the originals. What can you contribute? Spread the word. What can your friends contribute? We will make this happen. Remember our 2 week “volunteer camp” starts on Saturday 22 June 2013. Its gonna be cold, its gonna be hard work, but its all worth while. 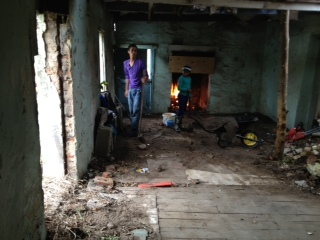 We found the cottage in a severe state of disrepair – some of the bricks are mud bricks other on kiln burnt clay bricks with mud and lime mortar. the rain coming in though the holes in corrugated iron roof has got to the walls and is causing them to “dissolve”. I fear the whole house could very soon come crashing down. 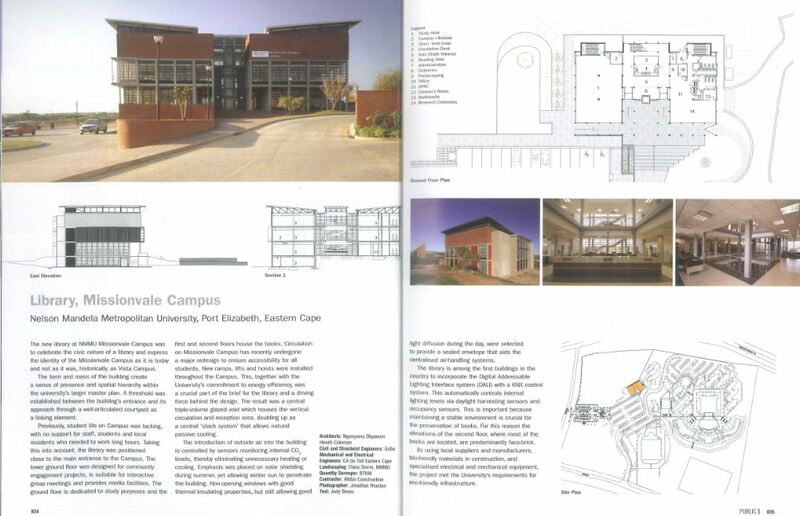 We are very happy to see the NMMU Missionvale Campus published in the 2012 edition of The South African Architectural Digest. Climate change is a serious threat to our continued success as a species on this planet. Thankfully we have now developed the consensus that continuously growing human consumption and destruction are a cause for urgent concern. Much of this continuous growth and destruction expresses itself in what we call the “built environment” The UN Environmental Programme (UNEP) tells us that buildings through their life time consume 48% of all the energy consumed on this planet in any given year. That’s a lot! This energy is consumed during the manufacture of construction materials, the transport of these materials, the construction process, lighting the building, heating the building, cooling the building, cleaning the building, ventilating and eventually demolishing the building and carting away the rubble. But the UNEP also tells us that good news is that buildings (compared to manufacturing, transport and others) require the least amount of cost to release the greatest impact on limiting green house gasses. These strategies are not new. We just now, for the first time since the industrial revolution seem to have the collective will to do something about it and to change the way we build. Clearly, changing the way we build and employing the strategies that we know need to be employed will require innovation, design leadership and creativity. We are therefore very fortunate that we do not live in Somalia or Southern Sudan, because in South Africa we have access to the professionals able to provide top quality innovation, design leadership and creativity. The skill set is in fact already available and ready to be mobilised. So, what then is the problem? The problem is that we have adopted public and corporate institutional arrangements that are unable to effectively mobilise that skill to address the challenge. In fact, at a time when we are to rely even more heavily than ever before on our Architects, innovators and designers, we have been caught up in the systematic “commoditisation” of this critical form of leadership. In both the private and public sector, we have become increasingly obsessed with standardising procurement and “supply chain management” issues. We insist that we procure the services of an Architect to innovate new solutions for the built environment in the same way as we procure toilet paper, grass cutting services or a fleet of refuse trucks. It’s crazy! What results from this standardised procurement practice where “cost is king”, is that the services of the Architect become progressively cheaper and cheaper. The cheaper the product, the poorer the service. Simple! We are currently doing some work in a city called Chengdu in Central West china. From our Port Elizabeth office, Architects trained at NMMU and nurtured on the Port Elizabeth design community are doing excellent work designing innovative green buildings in a country where we hear that they plan to build 800 new cities in the next twenty years! But why are our company’s skills and the skills of hundreds or American and European firms in such demand in China? Not because we are cheaper, not because we are faster, not because we are more compliant than the thousands of Chinese architects. No. It is because we offer innovation, creativity and design leadership. The qualities that could have been abundant among Chinese Architects, if not for the wave of aggressive cost cutting, and “industrial efficiency” that became so widespread during the years of China’s construction boom. China’s Architects and designers are now very cheap, very fast and completely compliant, but unable to live up to the expectations of the increasingly discerning Chinese private or public sector property developer. So, the developer turns to the “West” .Very sad. But, it’s not too late for us. We can learn from these errors South Africa still has a very strong community of Architects and other designers focussed on excellence and committed to a better built environment. So what must we do? What action must we take? Can I suggest the following? If we build green buildings we can save the planet. It’s as simple and as dramatic as that . Failure is not an option. We must succeed! Who built a Crooked House? 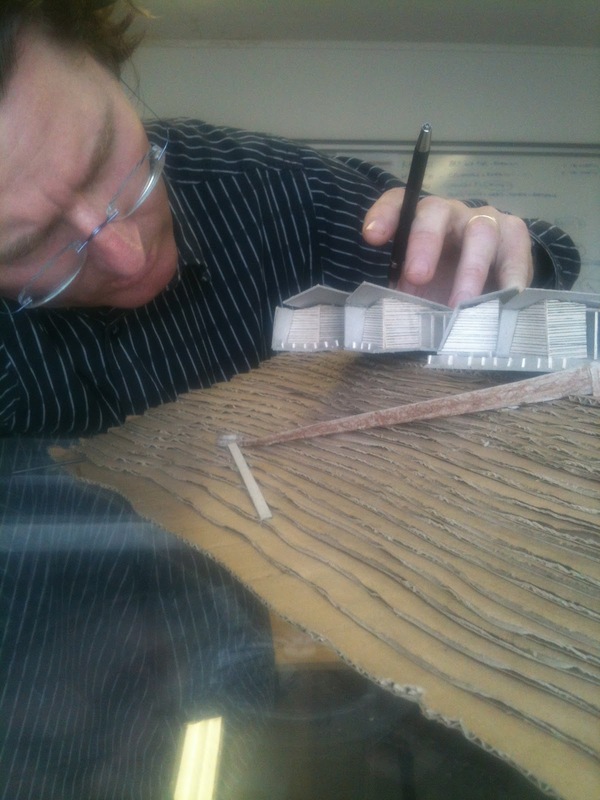 Architects are living through fantastic times in this city and South Africa generally. Not only is there an abundance of work, but a heightened awareness of the value that Architects are able to add to the built environment. There is such a lot of “cool” stuff to do, that I am worried that we try to do too much and loose out on the enjoyment of doing one thing well. I believe though that it is better to take action than to worry! …So I have taken action. I love beautiful buildings. Big buildings, small buildings. I love being inside them. The light, the sound, the way people use them. The way they sit in the city or landscape. I love the way these buildings are put together. There is magic in that; and I am starting to reconnect with this magic.. What surprises me is that I have felt that reconnection not in the billion rand, high visibility, world beating projects running through our office, but rather in something a little more modest…. When physically building you are compelled to focus on one task. You are compelled to be present. Not to think about the next meeting or the previous phone call. How often do we get a chance to be focussed on the present? Especially those of us in management positions can lead a very fragmented and frantic existence. Many of us have powerful and creative minds but have created a reality for ourselves where we spread our input (and out impact) so thin as not to add the value that we could. Building in the forest has helped me see the potential of my own hands and energy. I can actually build a house. WOW! The real truth is that Murray and Roberts could probably build it a little neater. (OK,… a lot neater.) But it is not a competition. We are building the house because that is what we need to do to meet our needs and aspirations right now. We are not building the house to try to compete with Murray and Roberts! But what I am talking about here is something more widespread! A phenomenon that spreads across our lives and effectively limits what we believe we are able to do. We are intimidated by the corporate and media dominated world through which we move every day. We slowly begin to believe that we are not good enough to take action. We cannot sing as well as Mariah Carey, so we will never dare to sing at a family dinner or in the pub. We cannot tell stories as well as Stephen King, so why even bother trying. Mom cannot make clothes as neatly as Edgars, so we’ll rather stay at home than be seen dressed in her homemade tracksuits. We cannot build as well as Murray and Roberts, so lets not let people laugh at our crooked house! The net result is that we become intimidated into inaction allowing big corporate and media giants to do for us what we used to do for ourselves, and it only takes a little time before we have lost our skills and our dignity forever. I have in the forest found the joy and freedom of taking back that which I thought I had been robbed of. Cutting planks, laying boards, nailing trusses. Author Tim Hewitt-ColemanPosted on 2007-05-27 2018-04-03 Categories All Posts, Freedom & BuildingLeave a comment on Who built a Crooked House?